"We come across a lot of great vocalists here, at The Deli, but few invoke the classic soul-vibe quite like Boston singer-songwriter Louis Apollon...The first single, "You Are a Dream", embodies the character of 70s soul giants, like Al Green, with Louis' own jazz/folk flavor. Louis' voice has a soothing quality, his dulcet tones blending with the no-less-impressive fingerwork of his guitar." Watch the live performance here. I was born in Poughkeepsie, New York. I had my hand in soccer and baseball growing up, but I was pretty terrible at both. I was the kid who locked himself in the band room during Spanish class and played guitar. Some of my earliest memories include singing at the ocean. My dad would play guitar as I fell asleep in my crib. I learned music the same way people learn English – I speak it...."
"Jakals perform 'A Billboard of the Horizon,' become one of the Week 1 winners of Katrina's Bar & Grill's $1,000 Singer Songwriter Challenge in Gloucester, MA." "In vs. Self, King blends guitar acrobatics with an emotional and intellectual sensitivity to craft a reflective journey that defies genres and expectations. Although you won’t find any vocals on this album (King is an instrumentalist only), that doesn’t detract from its cinematic imagery and vivid storytelling. Each of the nine original tracks feature nothing but solo guitar—something many listeners have difficulty believing, given the fullness of sound." "Boston guitarist R.D. King is preparing to release an album of masterfully crafted instrumentals in vs. Self, his debut effort. Comprised of nine tracks of transformative journeys of sound, King fully utilizes and expands the capabilities of the instrument, creating an ensemble sound with his fingers. It's easy to get lost in the genre-defying work of King, with each track taking you to a different, unexpected place, from classical to pop to progressive metal and beyond..."
Read the full article and listen to "An End To Wandering" here. R.D. King Releases Debut Music Video "An End To Wandering"
On April 12, fingers-blazing Boston-based instrumental guitarist R.D. King released his debut music video, "An End To Wandering." The track is the second to be released off of King's debut album vs. Self, due to be released on April 27th at The Rockwell Theatre alongside Jenee Halstead. Click here to watch the jaw-dropping music video, and click here to purchase tickets to R.D. King's debut album release show on April 27. Louis Apollon Launches Kickstarter Campaign For Newest Album, "Free To Be"
On April 1, Talisman artist Louis Apollon launched a Kickstarter campaign for his newest album, "Free To Be." "I'm planning to make an incredible record filled with the beauty of the human experience, which to me is all about our relationships, imperfections, conversations, and how we treat each other and the world we live in," explained Louis. "As a person, I try to make a positive impact, and I feel like that has transferred to my writing. This album will speak to the hearts of its listeners with a positive energy that’s both warm and uplifting and I hope it will inspire us all to feel “Free to Be” whoever we wish to be. With your help, my team and I can bring this incredible project to life! We won’t let you down." Visit Louis' Kickstarter Campaign here. "On March 31, Hannah Christianson won First Place in the Great American Songwriting Contest's "Pop/Top 40" Category for her original song "Break The Frame" from her most recent album, Grow The World You're Dreaming Of (2016). Talisman Music Group Highlights are designed to shed light on events that will help elevate you to your maximum potential as a musician: community-building events, workshops, meet-ups, shows, and more. Emerging artists excel by meeting movers and shakers in the community who can help them open doors and connect with others. Below are a bunch of upcoming events where you can build relationships with local gatekeepers in Boston's music scene. Some of these events are limited capacity, so be sure to snag your tickets in advance! 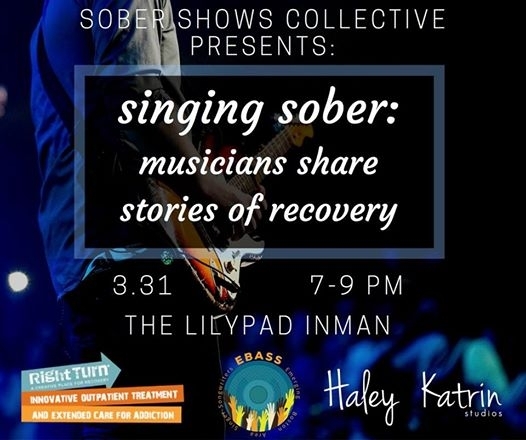 Details: On March 31, Haley Katrin Studios, EBASS, and Right Turn present Singing Sober: Musicians Share Stories of Recovery. Celebrating the strength and power of those who choose to embrace sobriety, this event will feature internationally renowned Melissa Ferrick, MB Padfield, and Anjimile sharing their stories of the struggles, difficulties, and rewards of the journey towards recovery. The event will also feature an open mic where audience members can share their own experiences. We welcome everyone, sober or not, to join us in a gathering and celebration of Boston's sober music community! Tickets limited; get yours here. Details: For one night only, Boston radio DJs past and present, radio junkies, and music lovers alike will come together to support the latest local addition to our airwaves: 94.9FM ZUMIX Radio. 94.9 ZUMIX Radio is a youth powered and community-based radio station giving voice to the next generation of Boston radio DJs. The station was launched in 2016 by ZUMIX, a local youth arts non-profit. Since 1991, ZUMIX has provided free after-school music and creative technology programs for low-income youth in Greater Boston.Featured DJs: Adam 12, Akrobatik, Anngelle Wood, Carolyn Kruse, Dana Marshall, DJ Bean, George Knight, Jerry McKenna, Jess Phaneuf, Jim Braude, John Laurenti, Julie Devereaux, Lori Grande, Matt Phipps, Merilee Kelly, Mike Gioscia, Morning Guy Tai, Nancy Quill, Neal Robert, Nomadik + MORE TBA! Details: This is a FREE event exploring and celebrating the 2016 Iguana Music Fund recipients. The Iguana Music Fund is an annual grant program predominantly funded by a generous anonymous donor, plus the help of Passim, sponsorships, and community donations. Each year the Iguana Music Fund gives approximately $40,000 in grants to individual artists in amounts from $500 to $2,000 each. Grants are used for projects and expenses to aid in artists' career growth, and range from recording projects to community programs to specialized equipment or instruments. Get tickets here. Details: This years awards ceremony will feature live performances by: 2015 Female Performer of the Year; Ruby Rose Fox – 2015 Band of the Year; Dwight & Nicole – 2015 County Act of the Year; Annie Borbst – and 2015 Rock Act of the Year, Cold Engines – and a special performance by; LoVeSeXy – A Tribute to the Music of Prince also performing live at the event; Sygnal to Noise, Julia Russo, Karina Rae, and The Balkun Brothers – Your Emcee at this years ceremony and celebrating 20 years on the air as host of The Cheap Seats; Cat Wilson. Get tickets here. "I first caught King at a small Gallery show in Cambridge a while back and his playing style and penchant for flair and lightning quick fretboard work left me with my jaw on the floor. It was spirited but controlled. Beautiful and classical in nature but somehow totally rock n’ roll…on an acoustic guitar. There was just something about his playing and his songs that transported me in a way that I frequently find it hard to experience with a solo instrumental musician. Those who have that ability and few and far between so when one comes along its all the more impressive and you can’t help but take notice. We caught up with R.D to talk about the record, his writing process and the struggles of fitting into a community of primarily lyricist type songwriters and finding your niche while remaining true to the art that you want to create. Check it and give the new single “Heartstring” a listen (or 12)..."
Read the full article and listen to the single here.